Each year Goodwill Industries of Middle Tennessee recognizes outstanding members of their community at the Impact Luncheon Awards ceremony. From achievers and volunteers to community partners, ambassador, and donors; Goodwill celebrates the contributions that help make the organization one of the largest employers in the region. This year, in addition to recognizing outstanding members of their community, Goodwill also received a donation of $5,000 from mobility partner, Hytch Rewards. The donation will go towards rewarding Goodwill employees who use the Hytch Rewards app with real cash for choosing to share rides by carpooling or using public transportation. But Hytch didn’t cap its efforts with a one-time donation. Instead, Hytch challenged its users to join the donation efforts by giving some of their own cash rewards towards supporting the Goodwill employee rewards program. To do this, users can now cash out using the new "Donate to Goodwill" method in the app. Goodwill is no stranger to the mobility problems faced by an entry-level workforce. For the last several years, Goodwill’s Wheels-to-Work program has provided donated vehicles to employees who lack reliable transportation to work. With the donation from Hytch, Goodwill will be able to extend its efforts to alleviate the stress felt by those in the workforce due to the cost of transportation. The Hytch Rewards program was immediately met with excitement from Goodwill store managers like Lashira of Goodwill of Berry Road Nashville. Lashira was so thrilled to hear of Hytch that she made sure her store was the first to launch the program. She explained to Hytch that she sees this program as something that can benefit all of her employees, but one in particular who doesn’t own a car and often walks to work. While Lashira picks Robert up whenever she can, she knows the extra money that Robert can earn through Hytch will help alleviate some of the strain Robert, and others like him, feel when it comes to finding reliable transportation to work. Join us in supporting Goodwill’s commitment to changing lives through education, training, and employment by donating your Hytch Rewards right on the app. 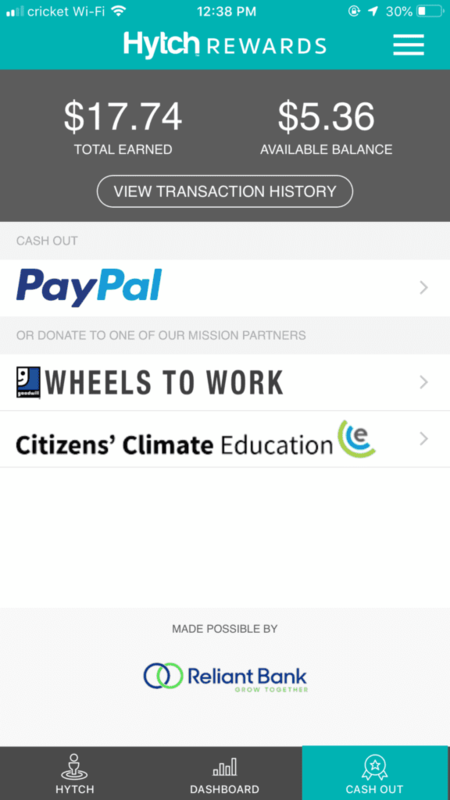 Simply select the Wheels to Work option on the cash out screen and your donation will go directly towards helping employees of Goodwill get to work.